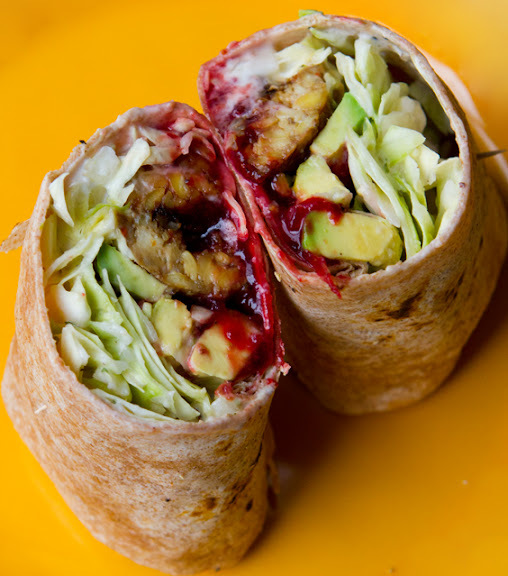 ZingBerry Holiday Wrap! 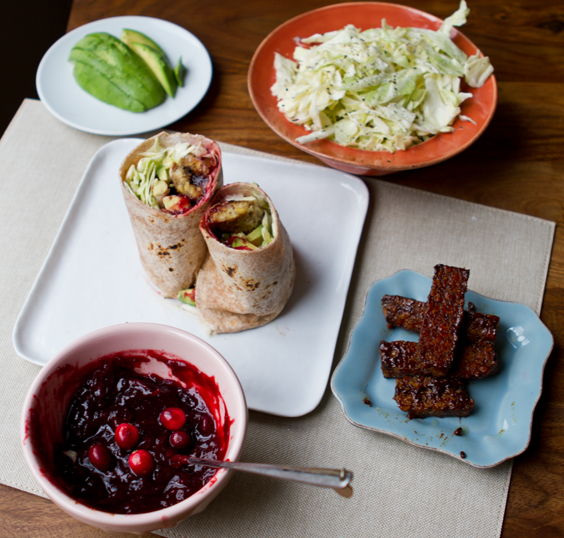 Tempeh, Cranberry, Slaw. After a sunny weekend of holiday loveliness, I'm finally settled in LA and ready to slowly sink myself into the warm fuzziness of the holiday season. 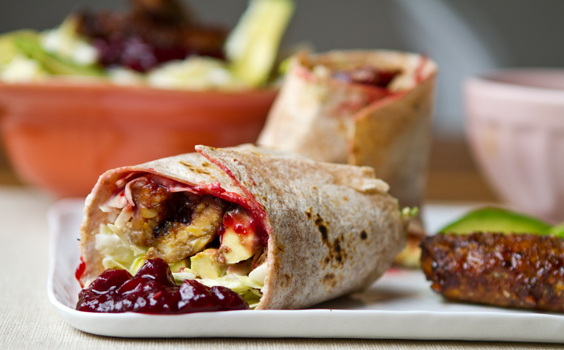 And perky recipes like my ZingBerry Holiday Wrap are just the thing I need to keep my mood peppy and my energy up for the busy food-filled month ahead. 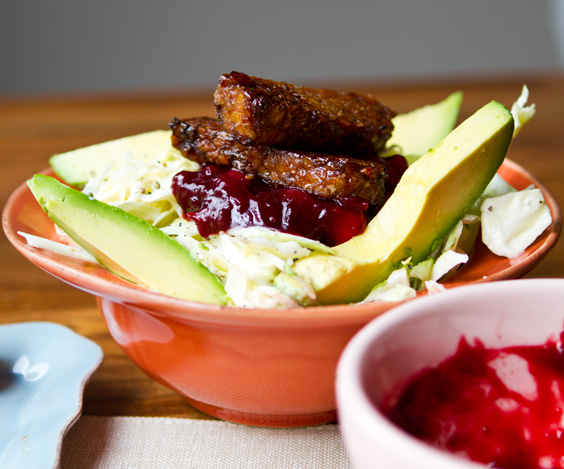 Over the weekend, I whipped up a Cranberry Tempeh Avo-Slaw Salad. I fell in love with the flavors. 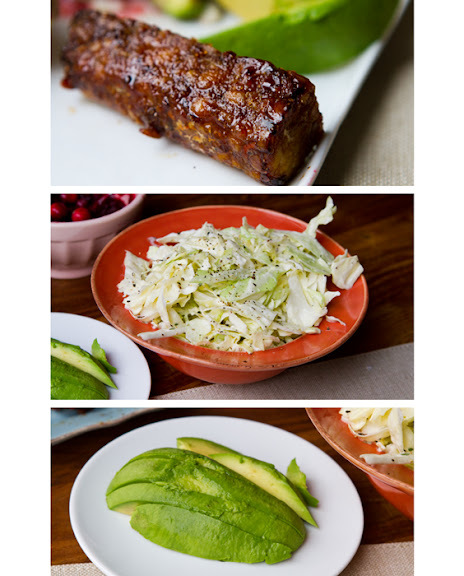 Sticky sweet tempeh coated in leftover Thanksgiving cranberry sauce - overtop super easy slaw and avocado. It was kinda my last hurrah to Thanksgiving. This is fall, really? The past 7 years I spent on the east coast, Thanksgiving meant whipping out my MooShoes boots, heavy scarves and winter coat. So my body is a bit confused by this "fall" weather. I can't wait to round up some to-go eats at all my have LA spots to do a nice photo-review of my have dishes. So I hope you all had a fabulous holiday weekend! And if you are looking for a fab Cyber Monday purchase to lead you into a healthy, happy New Year - might I suggest a Vitamix! Holiday deal: get a 32oz. extra container for only $50 (that is a deal, trust me!) Great to have an extra container around. My Vitamix was the best purchase I ever made for my kitchen. Get free shipping by clicking here..
1. Heat a saute pan on high with safflower oil. Add in the tempeh and sprinkle with a pinch of salt and pepper. Rotate logs until some oil has been absorbed and all sides sizzle into a nice golden color. If adding additional sweetener, add now – over top hot tempeh. 2. Turn heat to medium and carefully add in the cranberry sauce one tablespoon at a time until the logs are coated in sticky sauce. Continue to sauté for a few minutes. You can add in as much or as little cranberry sauce as you’d like. Salt/pepper to taste or add in that splash of soy sauce. 3. Cool tempeh in pan by removing from heat. The sauce will get sticky upon cooling. 4. For the cabbage – a simple good toss and fold with the dressing will do. Very easy and light. You want the cabbage to stay crunchy and zesty – yet with a nice hint of creaminess front he vegenaise. Chill in fridge if not serving right away or making head of time (the chilled slaw will be a a bit more marinated that “just made” slaw. 5. 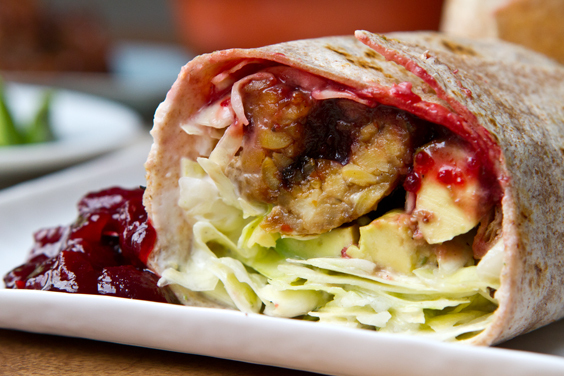 Warm your tortilla wrap and start adding ingredients: add the cabbage, tempeh, leftover cranberry sauce from pan (or chilled unheated sauce as garnish). Slice avocado over top. Add extra mayo and or Dijon. 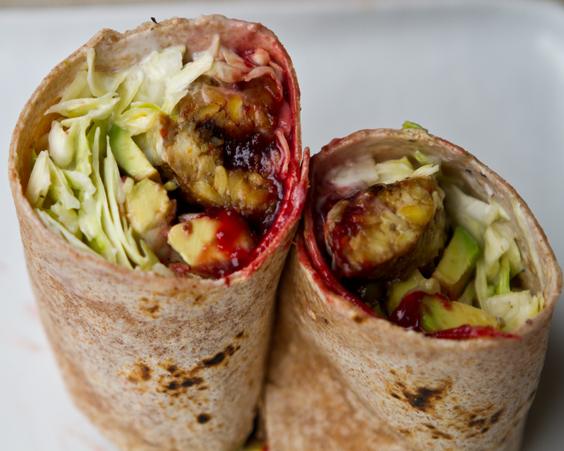 wrap and serve. Need "wrap-rolling" instructions/tips? Watch video one here!